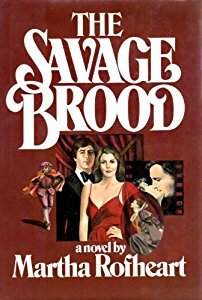 Having read two of Martha Rofheart’s other books, Lionheart and Burning Sappho (about Richard I and the poet Sappho, respectively), I decided to try her 1978 novel The Savage Brood next. It sounded different from the others, being a multi-generational family saga and concentrating on fictional characters rather than real historical ones. I liked it enough to finish it but, as I so often find with this kind of book, the earlier sections were the best and I struggled to stay interested as the action moved closer towards the modern day. The novel follows the fortunes of the Savage family, who have a long history as actors of one sort or another. It is divided into three sections which are set in different periods and work almost as self-contained novellas. We begin in Tudor England where we meet one branch of the family, a group of travelling players who make their living moving from town to town in a horse-drawn wagon and putting on performances for the local people. Finding English law too restrictive, the troupe move to Italy where, under the patronage of Cosimo I de’ Medici, they learn the skills of Commedia dell’Arte. After a short ‘interval’, the story then jumps forward to 1752 where some of the Italian Savages (or Savaggi, as they have become known in the intervening years), return to London’s Drury Lane to work with the great English actor and producer, David Garrick. Garrick identifies young Miranda Savage as a special talent, but loses her when she moves to America – just in time for the Revolution. There’s another interval and then we skip forward again, this time to San Francisco in 1906. The Savages have now made a name for themselves as vaudeville entertainers, but this form of theatre is in its final days as the first silent films begin to make their appearance. This section of the novel takes us right through both world wars and follows the careers of comic actor Sammy Savage, showboat musician Solange Sauvage, and Hollywood star JP Savage. As I said, the first two sections were the most enjoyable, at least in my opinion. The third dragged on for too long, and except for the wartime parts, when the action moves to France for a while, I found the storyline much less interesting. The characters were unlikeable and self-obsessed, lacking the charisma of some of their earlier ancestors and little more than stereotypes of early Hollywood stars. By contrast, I loved the eighteenth century section and was particularly fond of Miranda Savage’s cousin Beau, who rises from humble beginnings to become a stage and fashion icon. Taken as a whole, though, I found the saga of the Savages unconvincing, with too many chance encounters between people who turn out to be distant Savage cousins. Although Rofheart does acknowledge that women couldn’t act on stage in England until the Restoration, she does depict some of her sixteenth century female characters as acting with a travelling troupe. I didn’t think women were allowed to perform at all during that period (apart from in Italy), so that bothered me while I was reading, although I have since discovered a book on Women Players in England, 1500–1660, which suggests that women may have had more opportunities to act in sixteenth century England than I had imagined, at least on an amateur basis. I really don’t know enough about the subject to comment any further on Rofheart’s historical accuracy. Despite the problems I had with The Savage Brood, I think it will be a fascinating read for anyone interested in the theatre, incorporating almost every type of acting you can think of – Commedia dell’Arte, Shakespeare, vaudeville, film and more – set against a backdrop of major historical events. I’m not really in any hurry to read the rest of Martha Rofheart’s books, but if anyone has read The Alexandrian, Cry God for Glendower and Fortune Made His Sword I would like to know if you enjoyed them and if you think they’re better than this one? I usually do love these multi-generational sagas and the setting for this one is truly intriguing but I think, I will need this! Adding it to my TBR and will get to it in time! Thank You for an awesome, holistic review! It does have an interesting setting (or settings, as it moves between countries and time periods) and I think it’s worth reading, even though I didn’t love it. Yes, the theater aspect does sound intriguing and since I live in tinsel town I would probably even like the last section. Hm, this one doesn’t grab me. I agree with you, I tend to like the earlier sections and then lose interest in the more modern parts. I read The Alexandrian and I adored it. My mother read Fortune Made His Sword and she said it was good, but I think (if I’m remembering right) she enjoyed The Alexandrian and the Sappho book more. I have a copy of Fortune, which I should probably read…someday! It sounds as though I need to read The Alexandrian, then! I’m glad to hear your mother liked Fortune Made His Sword too. I’m very much a theater person, but I don’t know… this sounds very complex to me. Thanks all the same! It’s three separate stories in one book, really, and maybe it would have been better if she’d kept things simple and just concentrated on one time period.